Opens a dialog to define two file names. While originally intended for file parsing applications, this dialog function has been made general purpose for any application where the user needs to be prompted to select two file names. 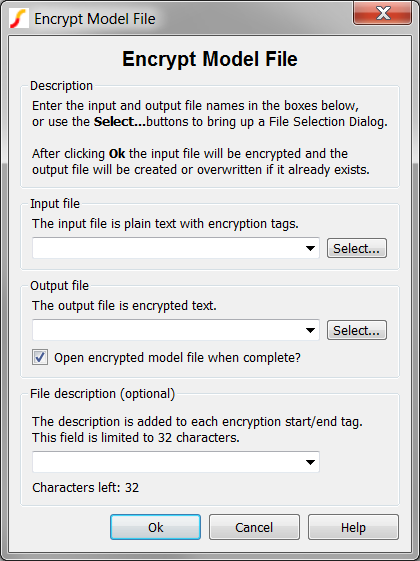 The dialog has file selection buttons which open a typical File Selection Dialog. The first file is the Input file and must exist on disk when the dialog is closed. The second file is the Output file and doesn't need to exist when the dialog is closed. The first argument defines the two file names and the description combo box text. The second argument configures the displayed text on the dialog including the caption, title, group box titles and so on. The third argument configures how the program remembers the input and output file names, description text and checkbox state. Each of these strings is a key in the user's configuration file, allowing the dialog to be used for many different applications with different memories. These remembered values will be displayed in the file and descriptive text combo boxes the next time the dialog is opened. The program remembers the last 10 file and description entries. The argument is a string array of length 3 which defines the input file, output file and description text. Additional arguments add GUI elements to the dialog. If the 4th element is passed, the dialog is configured with a set of checkboxes inside the Options group at the bottom of the dialog. Each additional argument up to the 7th element represents a checkbox. The Options group of checkboxes was added to SIMetrix/SIMPLIS Version 8.10c. The argument is a string array of length 13 which defines the dialog text. 8 Checkbox text Open output file when complete? The argument is a string array of length 8 which defines the memory and file selection dialog filters. 4 Input file type SIMetrix/SIMPLIS has several internally defined (and user customizable) input file types. An empty string will open the file browser with all files displayed. 'none' no replacement is performed on the output file string. 'file' the replacement text supplied in index 7 is applied to the end of the file name before the extension. This occurs when the user selects a file using the file browser selection button. 'ext' the replacement text supplied in index 7 is applied to the end of the file extension. This occurs when the user selects a file using the file browser selection button. 7 replacement text for index 6. If the user selects Cancel the function returns an empty vector.